With the NBA trade deadline now in the rearview mirror, we’ve got a lot of teams who will be materially affected by the items, some new players expected to be available and some expected not to be, and a whole lot to keep track of while building lineups or placing bets today. So ride along with me as I break down all the games on today’s slate with whether I’m switching to or away from them or whether I’m hedging based on the ownership we project as I attempt to guide us all to glory on DraftKings, FanDuel, and Yahoo. Learn more about today’s slate by trying out a premium account here at Awesemo.com. Between the top player in DFS’s rankings and ownership projections, plus projections from our Josh Engleman and rankings from Fast Eddie Fear, you’ll find a lot of ways to move above the field with the information provided. Promo code SWITCHANDHEDGE will get you 50% off the first month of any membership (including ones that have Fantasy Cruncher) so go sign up now! 👉 How Have You Improved as a DFS player? 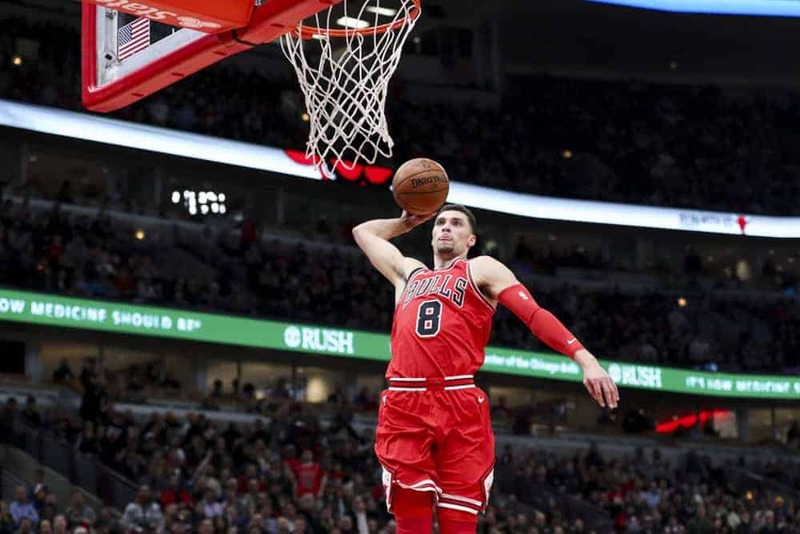 My conundrum on how to handle the Bulls that I’ve discussed in this column multiple times has now become a national crisis as a popular Zach LaVine went off the other night and now projects to be one of the highest owned players on the slate alongside teammate Lauri Markkanen. I like LaVine and this is not a terrible spot for him but I do wonder how much exactly Otto Porter will take off the table in terms of usage and whether it makes LaVine a bit too risky or if maybe he inhibits Markkanen, fresh off two straight 30 point games. For that reason, I’d likely just match the field on these guys at around 20% projected ownership while hoping perhaps Kris Dunn loses some of his shots or that staggering of lineups mostly keeps these guys well-fed in terms of usage. It’s a risky spot but with the prices indicating a fairly appealing game stack scenario, I wouldn’t want to overlook it. The return of Caris LeVert from his catastrophic injury earlier in the year should take some opportunity off the table but it remains to be seen who’s the most effective or what LeVert’s minutes cap will be. If he’s around 16 minutes to start, similar to where Rondae Hollis-Jefferson returned to, then Shabazz Napier looks worth his relatively high ownership. But if he siphons a few minutes and shots away from Napier rather than say Rodions Kurucs or Treveon Graham, there could be a bit of risk. D’Angelo Russell’s role seems secure amidst all of this so I have no problem with him other than the usual chance that he underachieves or gets yanked around by coach Kenny Atkinson. The Bulls are still a hideous rebounding team and that shouldn’t change with their recent moves so one of Jarrett Allen or Ed Davis could get going in a big way here. Davis might interest me slightly more but there’s no real issue with either. It’s a back-to-back game for Minnesota but with a slate high 231.5 total in this game, I would want to have some pieces of this game and possibly some game stacks without much ownership outside of the key guys. Karl-Anthony Towns projects to be the highest owned guy on Minnesota’s side at 20% projected ownership and that number seems fair. Towns has put up 53.5, 69.75, and 78.75 fantasy points in three games vs New Orleans this year and with the Pels even more discombobulated with all the trades and non-trades, there’s no reason to expect much different other than the back-to-back. Jeff Teague’s potential return, as well as the less likely one of Derrick Rose, could affect the usage for Andrew Wiggins a bit but with him shooting 28 times last game and now getting a more hospitable defensive matchup I wouldn’t take him out of the mix. Dario Saric has also been on a nice run in his last two games and may be worth some exposure to with his price not too unreasonable and this fast paced spot. Anthony Davis in his return to the lineup is the first place to look and one could easily imagine him playing with a bit of an edge after his non-trade. He hasn’t been stellar this year vs Minnesota in the two games he’s been active for but the field’s 15% projected ownership seems possibly a bit low. Julius Randle interests me comparably even with his price up; he got 31 minutes in his return to the team off the bench and assuming things are now back to normal with their rotation, that run of minutes could pay dividends as a starter or off the bench. Everything else here is iffy…I can’t imagine paying $9,200 on DraftKings for Jrue Holiday with these guys back in the lineup but in a game stack with some cheap value, sure. Otherwise I’d like to see how the rotation and usage shakes out outside of the core guys before investing too deeply here. We just saw this game three days ago but now the Pistons have less offensive pieces and are at home and if the Knicks can somehow keep this close, it could be an interesting spot for both sides. The Pistons’ side projects for around 14-17% ownership for the four core pieces of Reggie Jackson, Andre Drummond, Blake Griffin, and Luke Kennard with Reggie Bullock and Stanley Johnson shipped out of town. Overall, I’m most comfortable with Blake and Drummond with them likely to just swing the ball outside less than they did for Bullock in particular; Blake’s FPPM without Stanley and Bullock on the floor goes from 1.28 to 1.38 while Drummond’s goes from 1.33 to 1.46. Reggie’s been a fine enough play for a while and should see a few more open looks while Kennard should benefit from getting into the mid-20s in minutes but it’s hard to imagine his usage suddenly soaring or even hitting Bullock’s levels. This is another game with one of the highest totals on the slate with a 230.5 combined total and it’s probably a little safer on the Nuggets’ side with their core group in tact. Nikola Jokic just had a monster day vs the Sixers a few weeks ago, a 32 point-18 rebound-10 assist triple double, and though that was a day where Jamal Murray was inactive, I would definitely want some exposure to Jokic at 17% expected ownership. Murray looked good in his return to the lineup last game so I’m also interested in him with his price still mostly down due to his time missed from injury. You can get cute with the fringe pieces like Malik Beasley, Paul Millsap (if available, he’s currently questionable), or Will Barton but I prefer the core pieces. I’d also love Mason Plumlee if he picked up a start again for Millsap but that remains to be seen. Joel Embiid feels like the Sixer to be the most comfortable with given his price, his 5% expected ownership, and the addition of Tobias Harris. The shots on the wing seem more likely to be affected by Harris, who had a 23.6% usage rate and is replacing a much lower usage rate player in Wilson Chandler, so I worry more about the prospects of Jimmy Butler and to a slightly lesser extent Ben Simmons. Harris is more of a scorer in isolation, similar to Butler, so I do wonder a little if these changes will add to Simmons’ assist upside or result in him having even less time with the ball in his hands. Loading up on groupings of these guys will be a lower owned play than they should be given the total and talent of the guys involved so it’s interesting to have more than the field on these guys. But the risk is there because there’s only one ball and so much usage to go around. With Alec Burks shipped out of town alongside Rodney Hood, there’s some opportunity to go around in the Cavs’ backcourt in a pace-up spot vs a weak defensive team. Collin Sexton exploded in an awful spot vs Boston, shooting 24 times en route to a 27 point game with a few boards, assists, and steals. He’s not ever going to be a monster racking up peripherals but that kind of usage in a spot like this vs Washington is hard to ignore. Ditto Jordan Clarkson who didn’t look too great last time out vs Boston but will now get some extra run thanks to Burks’ minutes being available. The status of Kevin Love is another key to watch because his return to the lineup would be appealing but also would take some of the usage opportunity away from the backcourt as well as minutes from Ante Zizic and possibly Larry Nance so keep your eyes peeled on the news there. And this is super flimsy but given the flotsam in the Cavs rotation right now, it wouldn’t be a surprise if Marquese Chriss got minutes right away and was productive with them given the matchup, particularly if Love is out. Bobby Portis is in for the Wizards and Otto Porter is out and while the usage situation here worries me a bit in a pace-down spot vs Cleveland, I do think having some exposure to Portis makes sense. He could end up seeing a nice run of minutes and I don’t expect him to be shy about shooting vs a Cavs team giving up a slate high 49.2% from the floor and 37.3% from deep. The starting rotations here are also key to watch; if it’s Bradley Beal, Tomas Satoransky, Trevor Ariza, Portis, and Thomas Bryant (who’s interesting after his monster last game if the starting group doesn’t change from that one vs Milwaukee), I’m still interested in Jeff Green quite a bit with him having shot 16, 17, and 19 times in his last three games off the bench but only 10 times last game as a starter. If Portis is off the bench, he may end up with a facsimile of that Green role and that would be huge for a guy who loves to shoot and also rebounds at a high rate like Portis. Overall, there are some interesting options here and the ownership is low enough where you can differentiate a lineup. This is a relatively low total for a Bucks game but with Dallas expected for some guys with a good bit of ownership on them, I’d want to have some exposure to this game on the chance it stays close. Luka Doncic is questionable due to a thigh contusion but he would need to be in for me to want any of these guys. He’s been a monster since Dennis Smith got shipped out and all the usage left behind from Smith, DeAndre Jordan, and Harrison Barnes’ absences will give a lot of guys an opportunity to hit value if they can keep up with the Bucks’ scoring. Dorian Finney-Smith has had 10 rebounds in two straight games in addition to shooting at a decent clip and at his $3,900 DraftKings price, he’s worth matching the field’s 16% ownership. Dwight Powell’s minutes were up a bit to 27 last game and with comparable ownership on him, I wouldn’t want to miss out there either with his size and switchability a good reason to give him more run. Maxi Kleber will likely get some more shots from deep vs a Bucks team allowing a league high 35.6 three point attempts per game and with him expected to be lower owned than the other guys, I like that too. Hell Jalen Brunson shooting over 10 times in his last three games is even playable as long as Tim Hardaway’s ethically unsound gunning continues to come off the bench. It’s another spot where lots of pieces will have to contribute to keep this competitive so I like forcing in a bunch of these guys with a Buck or two on the other side as an under the radar stack. Khris Middleton is resting for the Bucks so with Nikola Mirotic not expected to be added to the lineup yet, there’s going to be extra usage to go around. Giannis Antetokuonmpo looks solid here at under 10% ownership; he averages 1.77 FPPM without Middleton and could feast. Malcolm Brogdon sees a big jump from 0.97 FPPM to 1.11 without Middleton and Bledsoe gets a more modest increase but both guys will see more shots as a result of the absence. Love the stack here while acknowledging that even a shorthanded Bucks squad can steamroll Dallas, especially if Luka Doncic is out. This is another game tied for the highest total on the slate with a 231 over/under and with all the core Suns pieces questionable, this is not a game to have a lot of love for. The Warriors are a 15 point favorite on the road and that does make it look like the blowout risk of all blowout risks on the slate. But if Devin Booker and TJ Warren are ruled in with both currently questionable, it does interest me to consider an option of the Suns keeping this close enough for guys to get their full run. The Suns keeping it close likely means scoring from those guys and a reasonably priced DeAndre Ayton. And with Josh Jackson on a nice run, he could be a contributor if Warren were ruled out though the minutes could be squeezed between those guys and Kelly Oubre if all four of the wings are in. Tyler Johnson is expected to be available and he could be the most interesting play regardless of this game’s status at a punt-level price and him likely to see a good run of minutes, particularly if De’Anthony Melton is still out. The Warriors have had a hard time getting more than one person to exceed value at a time with them on a run of big wins since DeMarcus Cousins joined the lineup. Klay Thompson generally seems like the best option because of his price and how he’s typically been an initiator of blowouts recently but it feels risky to have anyone here unless loading up on Suns in the hopes of them keeping it close. The last game on the slate may have a little bit of interest because of the rotation thinning out a little thanks to the trades of Tyler Johnson and Wayne Ellington. Dwyane Wade interests me the most with him projected for 17% ownership and seeing a boost to 1.15 FPPM without the two departed Heat players. Justise Winslow should also see more time with the ball in his hands and as much as I like the guy, he seems like a better play than Josh Richardson based on what we’ve seen this year. Dion Waiters could catch fire in the matchup and Kelly Olynyk could be solid too if he picks up a start again as a strong option to spread the floor at pace. Hassan Whiteside has been above 30 minutes in his last two games vs Portland and Indiana, although they were slower paced ones with bigs in need of matchup. If he gets run here, the pace-up and weak rebounding of Sacramento could result in a huge day but he’s always such a risk. The addition of Harrison Barnes to the Kings, and to a lesser extent Alec Burks, makes me leery of the Sacramento side. Barnes seems likely to take just enough usage off the table to hurt Buddy Hield and his time on the court could impact Marvin Bagley at the 4 and really cut Nemanja Bjelica to a peripheral role. I want to see these guys in action before committing, particularly given the pace down and defensively tight spot vs Miami. Follow me on Twitter @ChrisSpags and catch me on Live Before Lock with Fast Eddie later today on the Awesemo YouTube for more!